Make sure the halibut is room temperature before you start to cook it. To do this, remove the halibut from the refrigerator a half hour before cooking. Pat the halibut dry with a paper towel and salt generously. Heat a large cast iron pan over high heat. Place the butter in the pan and allow it to melt and coat the pan evenly. When it starts to bubble, place the halibut fillets in the pan, flesh side down. Press them down with a spatula so they get a good amount of surface contact with the hot pan. Allow them to sear for 3-5 minutes, until golden brown. Flip them so they are skin side down and carefully place the hot cast iron pan in the preheated oven. Allow them to finish cooking. Depending on the thickness of your fillet, this could take anywhere from 6-10 minutes. If you have a meat thermometer, remove the halibut from the oven when it is at 125 degrees and allow to rest in the pan for 5 minutes before serving. If you do not have a meat thermometer, use your hand to press down on the fish to check for doneness. If it bounces back, it is done. If you don't trust your hand, feel free to cut one of the pieces open and look inside. You want the very center of the fish to look slightly underdone when you pull it from the oven as it will continue to cook through as it rests. While your halibut is cooking, make the pesto by combining all of the ingredients in a blender and blending until smooth. If it is not blending well add a splash of water. Taste for salt and acid and adjust to your liking. Pour pesto sauce over cooked fillet. 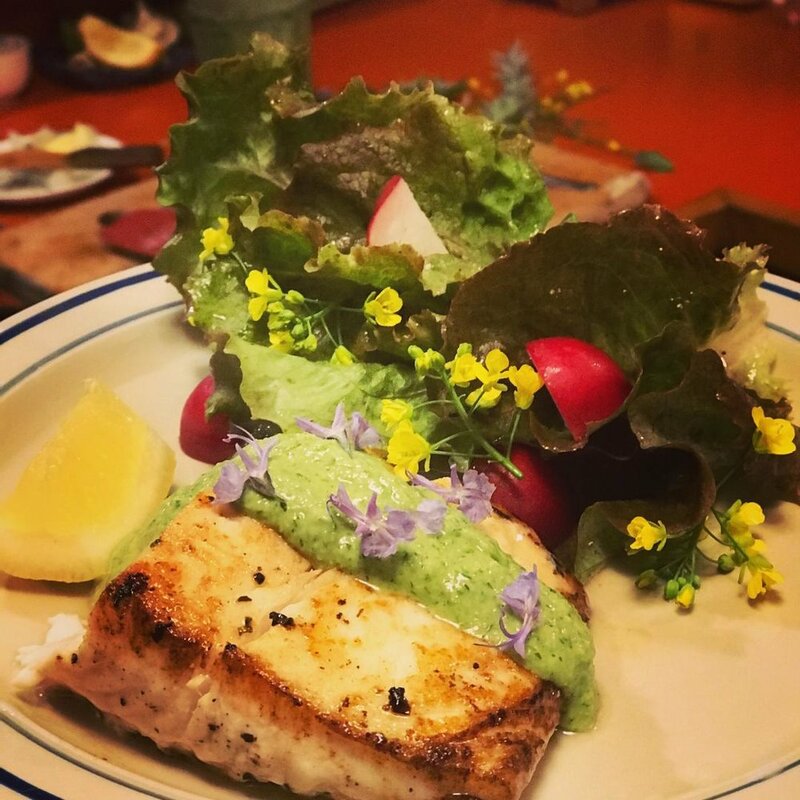 This green garlic pesto is a perfect way to ring in the beginning of spring time and the beginning of fresh halibut season! Serve with pasta, potatoes, or Israeli couscous. Enjoy! Be the first to know about the Fresh Catch, new recipes and specials. Sign up for our E-Newsletter (link to sign up) and be sure to check your preferences. We will keep you informed! FRESH, LOCAL, PREMIUM QUALITY FISH SINCE 1890.